← Social Networking – How it all happened! On January 27th, 2011, Steve Sordello, LinkedIn’s CFO, wrote on his blog that LinkedIn has filed a registration with the SEC for a proposed initial public offering for its Class A common stock. The blogosphere, alongwith several reputed magazines immediately touted this move as the firing of the first salvo for all the hugely promising social networking companies such as Facebook and Zynga. For example, see positive news here, here and here, but, if you would like some caution, see what Jim Breyer from Accel Partners has to say. How does this move matter? 1. In an economic climate that has been anything but rosy for the majority of the population in the US with 9.4% unemployment in Dec, 2010 (See: http://www.bls.gov/), this is indeed a great shot in the arm for all the pre-IPO hopefuls. Why? Innovation is not only driven by the GEs, Googles/ and Microsofts of the world, but also and infact, more so, by the entrepreneurs who disrupt the status quo in the industry. 2. Social Networking has gained so much traction in the last couple of years and most of us are aware of the Facebook juggernaut and Google’s woes (Please take a bow Google Buzz and Wave) in putting out a social product that matters. Lots of valuation numbers have been bandied about for Facebook including the more recent Goldman Sachs’ $50B valuation. Now, LinkedIn’s IPO will put things in perspective and test the waters in terms of how the public reacts to its shares. Not that the public sentiment towards a stock is a great metric, but, it does act as a data-point towards measuring the general consensus in social networking stocks. It might be prudent to be wary of a social networking bubble. 3. LinkedIn itself needs to up the ante and move on to the next level. Now why would I say that about a company that has released multiple products every month over the last 4 years and doubled its workforce in a year to about 1000 in 2010? Please read on as I try to dissect LinkedIn’s value-proposition, user-base and possible revenue models. 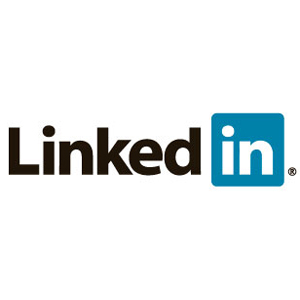 LinkedIn – A Professional Social Network; A social networking website connecting professionals. The LinkedIn website acquires users, engages and retains them through a wide variety of products. It has morphed into a job search tool, recruiters’ go-to product for head hunting and a collaboration website for current and ex-employees. 2. Recruiters use LinkedIn to make a more informed decision on candidates based on their profiles, recommendations, connections and activities. Competitors include the above-mentioned, as well as, Viadeo and Xing etc. 3. Corporate/Companies use LinkedIn to create a “presence” on LinkedIn and try to lure potential candidates. 1. Users (Job-Seekers, Recruiters and the rest) use LinkedIn to communicate with their network to provide updates about their career moves, key industry events, blogs and status messages about their activities. 2. Recruiters use LinkedIn to mine the available users data to scout for talent, actively reach out to professionals to gauge interest in positions they are trying to recruit for, and engage with other recruiters. 3. Companies actively engage their “followers” with polls, press releases and products announcements, post jobs and information about company culture etc..
4. The rest of the products such as integrated applications including TripIt, Amazon, dropbox.net, slideshare etc help users add more information to their profile and update their network about their activities. 5. Products such as Groups, Polls, LinkedIn Answers and Signals enable communication amongst unrelated professionals (unrelated through their network) but sharing a common group. Clearly, LinkedIn’s value proposition is in the strength and quality of its social network. As CEO, Jeff Weiner once famously responded to a question about Facebook rolling out a similar product with 2 words: “Keg Stands”. Those two words rightly answer the question about the competitive advantage (credibility and authenticity) of a niche professional network site such as LinkedIn and how Facebook with its seemingly loose and personal network value-proposition may never be able to achieve the same credibility and authenticity in a professional setting. 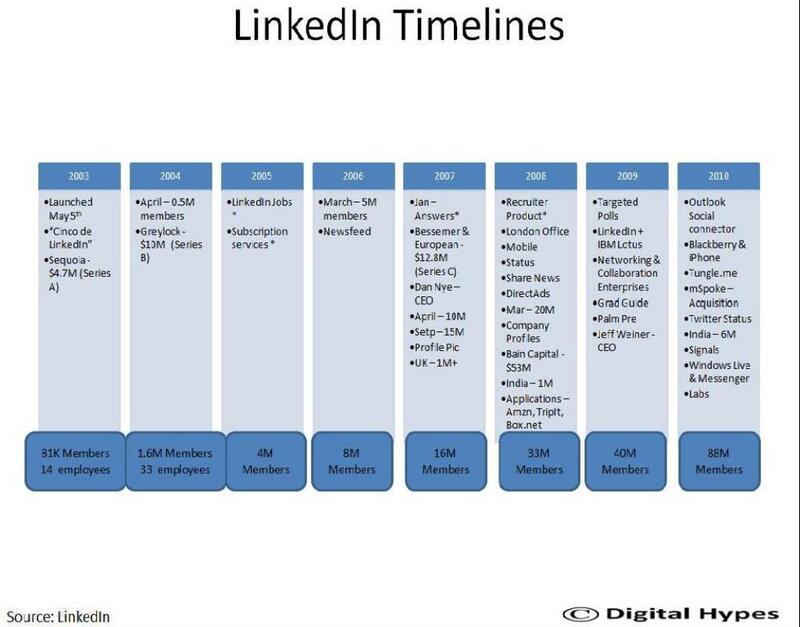 A quick look at the LinkedIn Timelines tells us that LinkedIn has basically doubled in users and number of employees since it was founded in 2003. It has also secured funding at key junctures from some of the most reputed venture capital funds in the industry including Sequoia, Greylock Partners and Bain Capital. After the first 2 years, with around 4MM users, LinkedIn started experimenting with paid services and products. 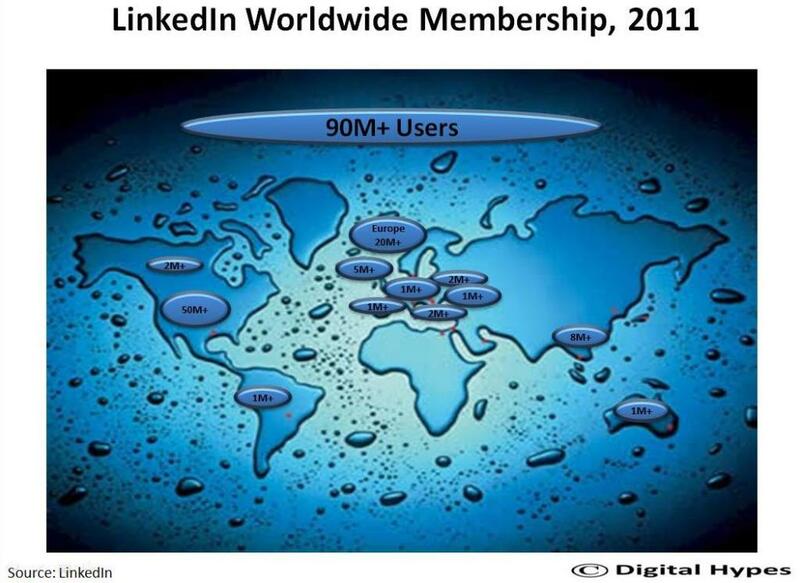 As of January, 2011, LinkedIn has 90+ Million members worldwide. The image on the right attempts to split the membership across different countries. It is obvious most of the growth has been in the US with over 50% subscribers in the US and some interesting numbers in Europe. Netherlands has the highest penetration rate. China is completely off the radar at this stage. There is a huge growth prospect. As of 2010, the world working age population is 4.5B (Data Source: United Nations, World Population Prospects). So, even if we assume LinkedIn can convert 10% of the working age population by 2015, we are looking at 450MM users by 2015!!! 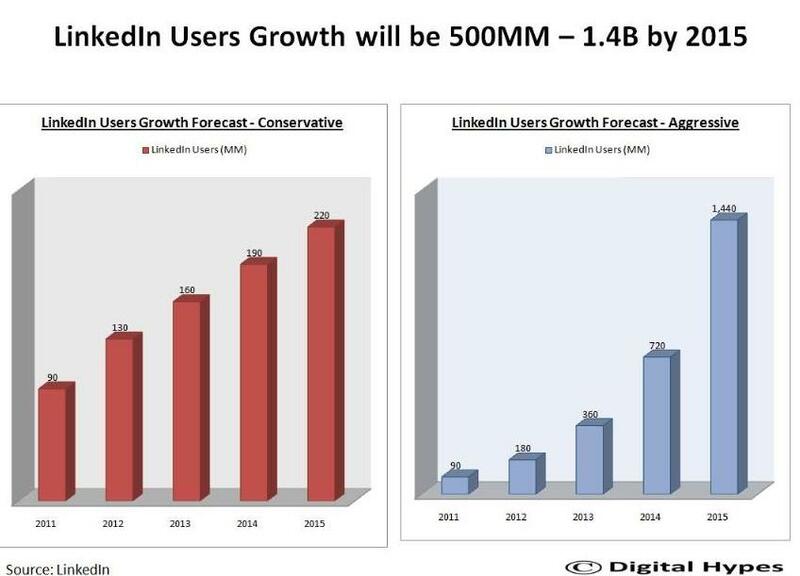 I have attempted to forecast potential user-base for LinkedIn for the next 5 years (including 2011). I have used two simple projections: an aggressive estimate that uses historic data and forecasts till 2015 by doubling each year and a conservative estimate with 40MM users added each year. (40MM users were added in 2010 and assuming LinkedIn has the same marketing expenditures, acquisition costs and target customers interest remain the same). The aggressive estimate yields 1.4B users by 2015 whereas, the conservative forecast results in a “meager” 220MM users by 2015. Finally, I chose the middle path and decided a 10% conversion of the 4.5B working age population across the world would yield closer to 500M users by 2015. And by no means, would this be a very aggressive target considering the fact that LinkedIn is still nascent in its market. Infact, I would hope and bet that they reach 500MM users sooner than 2015. Now that we have addressed LinkedIn’s value proposition and user-base, we will move on to the most interesting (personally) aspect about LinkedIn – its revenue models! 1. Upgraded Acccounts: Business, Business Plus and Pro Accounts provide extra features, including thorough lists of who’s searched for you and your company. Nothing fancy in these revenue models. These are quite straight-forward considering LinkedIn’s target customer segment (users and recruiters). Job-seekers will upgrade to one of the above accounts, recruiters and companies will use the hiring services or recruitment products and advertising on webpages with LinkedIn’s proprietary DirectAds technology (which, btw, is different from Google AdWords meaning there is no option to trigger ads based on keywords). The modus-operandi has been the tried and tested method of acquiring a lot of users and then generating money off of them. What’s unique about LinkedIn is that it didn’t have to search too far and long for a revenue model because its value prop is a revenue model in itself: People looking for jobs are willing to pay premium prices for advanced subscription services and similarly, recruiters are willing to pay a premium for access to a more targeted user profile and analytics or hiring products. 1. Collaboration Tools: Oftentimes, users have all of their current work-groups on LinkedIn, but don’t necessarily leverage their expertise except to post status messages or share posts. It would be a great idea to use some of the integrated applications such as dropbox.net, MS outlook, tungle.me etc to create a seamless collaboration platform for a project workgroup that interacts using email and IM on LinkedIn (or integrated apps) and shares documents etc. After the project is complete the workgroup can be dynamically removed. This is an important potential revenue stream because sharepoint and salesforce are offering similar services right now. None of these services are perfect yet. It is a case of what makes the most sense and is the least painful to adopt. If LinkedIn can offer a compelling product rather than just plugins through 3rd party apps, it will have a winner and a better use of its platform by users who remain dormant when not searching for jobs. 2. Search: Indeed or Careerbuilder offer a simple easy-to-use interface for job search tool. If LinkedIn is like Yahoo, these sites are like Google. There ends the analogy though because it is still an apple and oranges comparison. Search is very important and the current growth in data and users on LinkedIn has created an overload of information. I have 500+ connections and let’s say I care only about 10% of those connections at any given instance. I would like to know what they say, what they share, if there are interesting developments from companies etc. In the current LinkedIn homepage or profile setup, chances are I would have missed most or all of the interesting information I deem relevant due to “noise” from the rest of the 90%. Yes, I can “hide” users, use “signals” etc but the solution to delivering relevant content should not be to impose such conditions on the users, but, should be a “fuzzy logic” system that learns as it tracks users behavior patterns. The end result should be an uncluttered homepage with minimal user intervention while delivering the most relevant content to the users and a spanking-new search that enables users to get to the information they want which may include: a) searching for information shared (posts) b) searching through status messages for interesting links c) searching for recent job postings users may have missed d) searching through product announcements or twitter updates and lastly, e) use Google’s Adwords to feed these keywords searches as another source of revenue. 3. Interactive Games: To engage users LinkedIn has come up with polls, groups, answers etc. The users who use these products already heavily use LinkedIn. What about the majority that don’t? To lure the dormant users back to LinkedIn, it must offer social networking games including location based services for the professional network. I am not talking about the “Angry Birds” or “Mafia Wars” variety, though, it would be interesting to see how many people actually play those games if made available on LinkedIn. I am talking about games that meaningfully engage companies, work groups and LinkedIn networks. For example, companies can tie up with their healthcare providers and use a “checkin” system similar to Foursquare allowing users to form “informal” fitness groups at work and checkin whenever they go to the gym. Team-building exercises such as company off-shores etc can be brought online to mini-games that simulate team-building exercises. Ofcourse, “checkins” at company cafeterias is a no-brainer extension to the same theme. This is yet unchartered territory and there’s much scope for innovation here. Gamification is one of the most important emerging trends and there’s a lot that can be done in a work setup…ofcourse, not to the extent where all employees spend all the time playing “angry birds”. I would like to add more such revenue models but I will save it for another post. I don’t want to write a very long article and make my unfortunate readers run away. 1. With more cash comes more responsibility. With a $2.3B valuation and an imminent IPO, there is always the potential of bad execution on strategies or bad investments in highly ambitious or irrelevant projects with the increase in cash flow. But, I really liked the conservative statements issued by LinkedIn “for 2011, the cash would be used to invest in CapEx, R&D, Sales etc for future growth and LinkedIn may not be profitable in 2011″. This augurs well for a company preparing for the long haul. 3. Data and Information overload. As connections grow, data and information that a user has to consume grows as well. LinkedIn has to innovate in the user-interaction space and make some bold moves. While the homepage is good as it is, it’s far from perfect or helpful. Case in point: How many of you find asking a question and receiving answers straight-forward before it turns into “noise” or how many of you use Groups in a really constructive way. 4. Users spike. From my research, I learnt that most users create a LinkedIn profile and forget it until they have to look for a job. Or login once a week or month. Clearly, there’s much to be done if more than 50% of your users don’t actively use your product. 5. Sounding intelligent conundrum. On Facebook, you can do keg stands and you can say stuff that you won’t at work, in short, you can be yourself. On LinkedIn, you better be on your best behavior. Not only is LinkedIn suffering from such restrictions by design, but, it also has the big problem of enforcing users to say something intelligent when they share status messages. This is a good and bad thing. You go figure. 1) Penetrating into China is a big factor for long term (which could be shorter than we think) survival. I dont think this would happen. 2) Fickle users. Cost of shifting to a potential new rival product is not high. # minutes users spend in it matters more than # users. 3) Future revenue models cannot stray away from the core business model. 4) My best approach would be a) to find new ways to engage companies & recruiters and try to drive away the monsters and careerbuilders b) promote every college grad to have a linkedin presence c) have companies use it internally to keep track of their employees’ achievements. 5) I do not see myself buying its shares for a long term basis. Short term could be interesting because of the social networking hype. @Laka: Thanks for your comments and insightful feedback. To your points..
1. Agreed. China will be a big factor. You can’t afford to not have 1/5th of the population on your social network. 2. Agree to some extent. # minutes matters a lot. I have raised it on a number of occasions above, but, initially, it is also about setting up huge barriers to entry through making a lot of customers sign up. 3. Debatable. I see the merit in your argument though. I’m sure the LinkedIn folks will agree with you more than with me 😉 Innovation has to occur in the business models they have to sustain long-term growth.. I don’t think the core business model is wrong, but, they need to diversify for sure. Example: Virtual goods, credits etc..
5. Buy some of those shares and hold on for the long-term. Really great analysis, well done. And in followup to Laka’s #2 and your response, I agree that recreating the user base is a huge barrier to entry – and even if this only caters to certain geographic markets (and not china) it still has a lot of value – it’s my first choice for connecting with somebody professionally or cheking up on their peer reviewed resume. Thanks for the encouragement Vinnie! You raise an interesting point.. I don’t think I considered that..